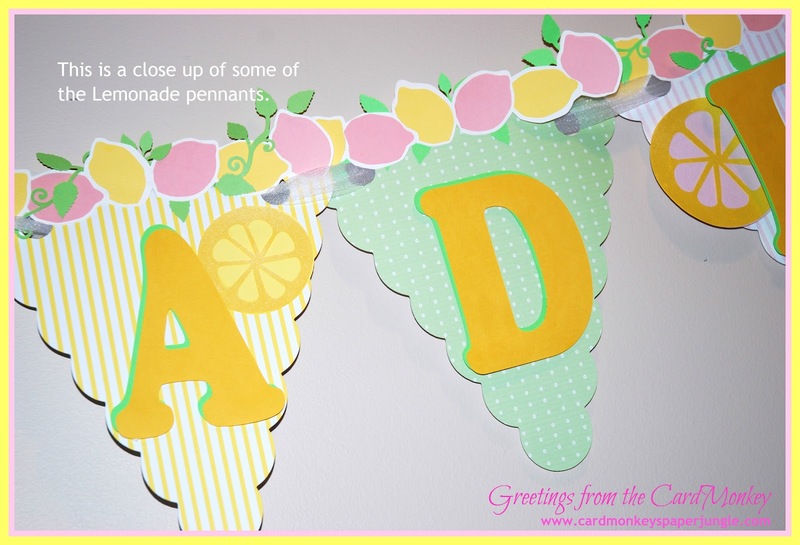 CardMonkey's Paper Jungle: Lemonade Blog Hop Today: Refreshing! Mmmm..... a cool drink of lemonade is sometimes all we need to quench our thirst on a hot summer day. 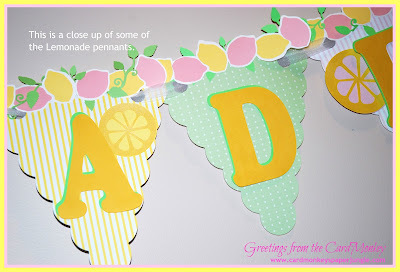 Even thinking about lemonade can bring relief, as I found when I made this project for the Lemonade Blog Hop on what's been the hottest day of the year so far! 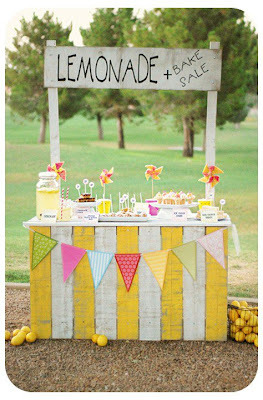 Here is my project .. a cute banner for the lemonade stand at The Sheffield Place! The Sheffield Place is a shelter for single moms and their kids, and it is the beneficiary of cards and banners in the monthly "I Feel The Love" Project sponsored by Madison Womack at www.funkycards.blogspot.com. I wanted this banner just so ... and as a result, yes, I spent much more time on it than I originally planned. 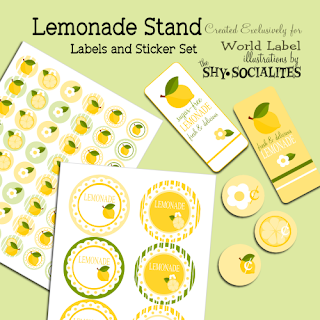 First, I designed ten different and complementing papers to print in lemonade color, pink lemonade, and limeade. To do this, I used Adobe Illustrator and printed on my home computer on standard white cardstock. Here is a close-up of some of the pennants. 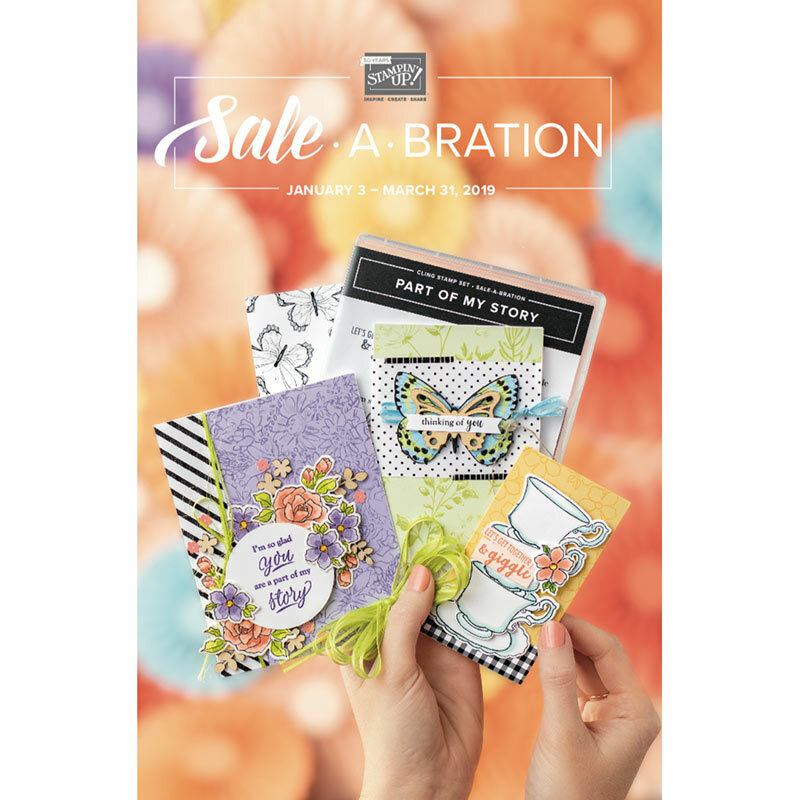 Making your own paper is fun and easy, especially when your stash doesn't include what's in your mind's eye for your project. I cut the pennants using Cricut's Art Philosophy cartridge. The pennants are scallop-edged, and are cut at 8.25". Mmm.. topped with frozen watermelon! I topped each of the pennants with a border of lemons that I found in Silhouette America's online shop, and cut with my Cameo. 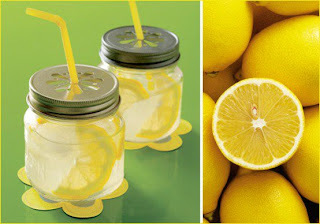 I alternated the lemons in pink and yellow, as pink lemonade is my favorite variety of the summer drink! I wrapped the border in leaf flourishes also from the Silhouette online shop. I'm sure lemons don't grow on vines, so allow some artistic creativity here, will you?! I also cut the letters using the Cameo in Cooper Black font. I altered the font, dragging it to make it the perfect size for my banner (4.5"h x 3"w), so you may not recognize it. I cut the lemon slices using the Cameo too. Art Philosophy cuts the pennants with or without holes to string the banners -- I picked with holes, thank you! I strung the banner together using white tulle for an added refreshing look of summer (LOL, and mosquito netting!!). 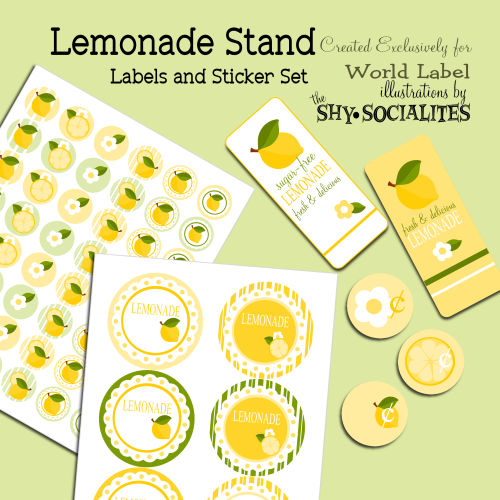 Here are some adorable Lemonade Stickers made just for YOU by World Label. You can download them free by clicking HERE, and printing them out for use at your next lemonade stand! I hope you like my project and that you'll join with me in supporting the "I Feel The Love" July project benefiting Sheffield House. Amazing banner, you did a fabulous job! It just screams summer goodness! What a super cute banner you've created... And for such a wonderful cause! Doing things like that definitely warms the heart. Adorable banner! Thanks for the freebies! 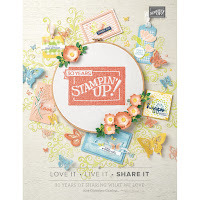 Love, love the pretty banner, thank you for the freebie printouts. great banner, it looks professional! Another fun idea. I love banners! gorgeous Ellen, I love your banner!! 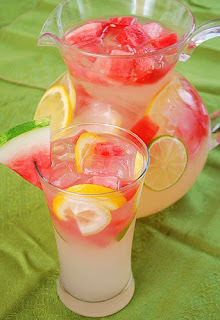 oh and thanks for sharing that lemonade pix, I'm going to top my next lemonade with frozen watermelon, too fun! I am so into banners...yours turned out amazing!!! Love everything about it! Your banner shows all the thought and time you took, it is very attractive! Awesome job on the banner!very beautiful! Oh my gosh Ellen that is so awesome! I not only LOVE your project I now HAVE to have a cameo. I didn't realize they have the ablility to cut around the prints. I was reading about it on the cricut board last night believe it or not and there is just raving reviews! You need my printer and i need your cutter, lol how funny is that? Hubby swears I have to get rid of my Pink E before getting a Cameo but I am thinking I am going to have to get a little crafty on this one! Not that I have room for both but still. WOW, you confirmed I am sold... now I just need time to make out for the perfect plan, Baw haw haw haw! NOt only that, I want LEMONADE now! thanks for the free stickers! Your banner is adorable, and sure to draw customers! Sooo refreshing. Love all the lemons on top. Wonderful banner. Like lemonade. Banners are very popular. This banner is so adorable Ellen! I love the vine :) And great lemonade ideas too - frozen watermelon in pink lemonade? Love it! Thanks so much for sharing these super cute stickers too! wonderful banner. I love the papers that you created for this project. So cute Ellen! Love the pink and yellow lemons at the top of your banner! :) Nice hopping with you! Love the banner and refreshing drinks. I love your banner! AND for such a great cause. TFS. I love banners and yours just says Summer! CUTE! CUTE! CUTE! Love the color combo and the entire project, Ellen! So nice to be in another hop with you! What a cute banner!! Your lemonade topprd off with watermelon looks delicious!! I love your banner and you! You are the best. Thank you so much for all your support. You ROCK! The banner is amazing! I can't wait to see it and all the details in person. You always amaze me. What an adorable banner. Time well spent for a great cause too! Thank you for sharing it. super cuteeeee banner. Happy to hop with you!!! Awesome Banner. I love the lemon you add.